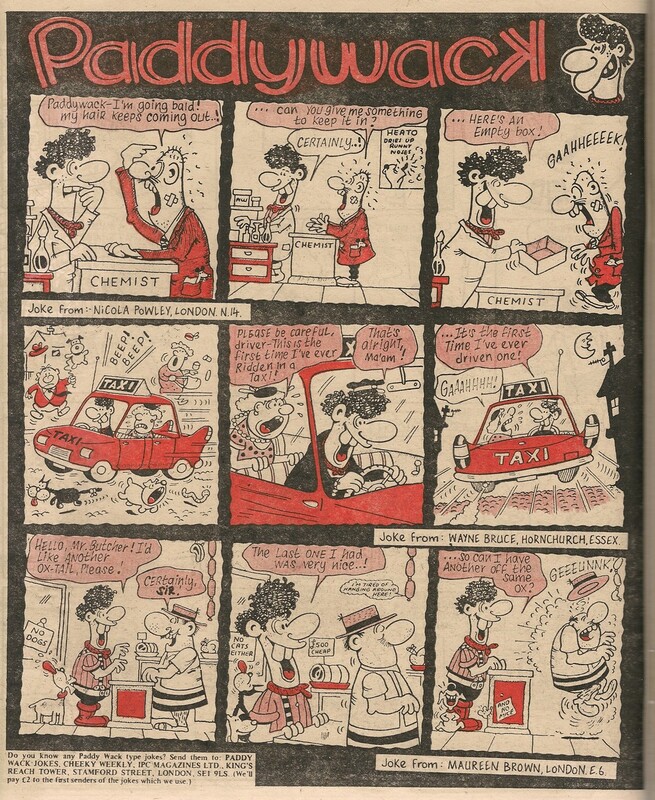 Page 32 was of course the back cover of IPC’s humour titles in the late 70s (except in cases such as Cheeky Weekly’s two 28-page truncated issues). Let’s see what this prime, colour-bearing site had to offer readers over the course of the comic’s existence. In the inaugural edition of the toothy funster’s title, the concluding segment of the Saturday picture show sequence was to be found in the subject location, together with a message from our grinning pal advising readers that the following issue would include a free ‘joke-filled’ Fun Wallet. 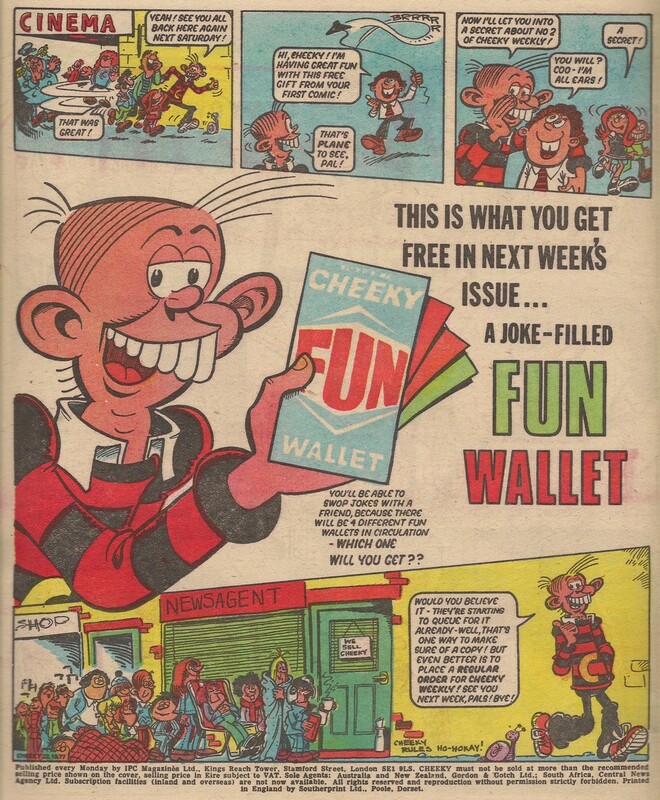 The visual of Cheeky which accompanied this announcement was somewhat disturbing, as whoever assembled the image allocated a left hand to his right arm (the same unsettling image was used on the What's New, Kids features dated 12 November and 24 December 1977 and 07 January 1978). A week later, with bonfire night approaching, firework manufacturers Standard placed a full-page, colour ad on page 32. The ad took the form of a snakes-and-ladders-style board game featuring a selection of their incandescent products together with cautionary content such as ‘You are under 16 and try to buy your own fireworks. It is not allowed! Go back to [square] No. 4’. Hopefully all Friends of Cheeky were sensible enough to follow the sage advice in Standard’s advert and thus fit and ready to read issue number 3 which on its back cover included the first part of the skateboard booklet, as did page 32 in the following three editions. Immediately following the conclusion of the skateboard booklet was another cut-out-and-keep feature, this time a 1978 diary. Once again this ran for 4 editions, which seems to have been the default duration for all such promotional schemes. 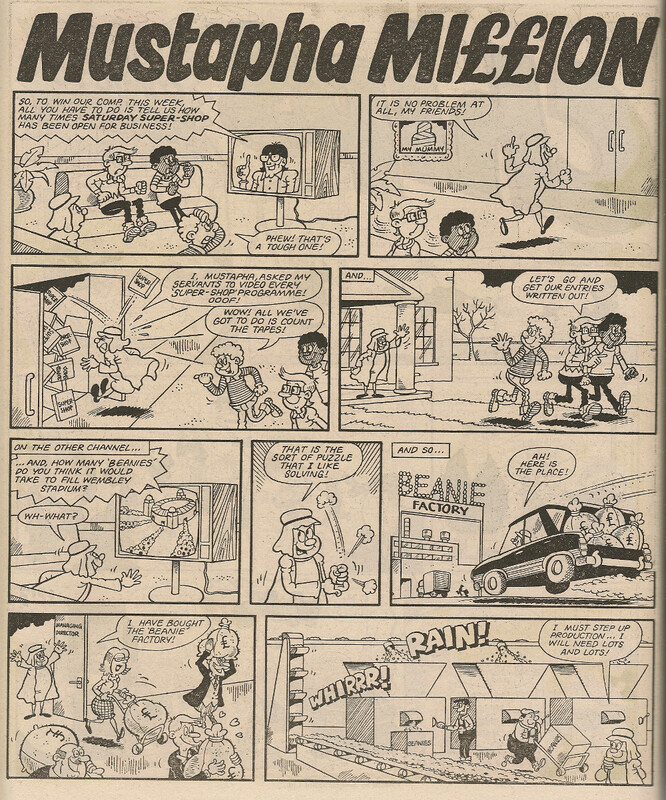 In the comic dated 31 December 1977 the back page documented the Cheeky family’s preparations for their new year party, and ended on a cliff-hanger regarding the identity of the first person to cross their threshold as the chimes of midnight struck. Cheeky’s mum told him that he would have to kiss the first attendee if female. The toothy funster feared that he might be required to plant a smacker on Libby, Ursula or Louise, while his dad hoped that luscious Lily Pop would head the queue of revellers. 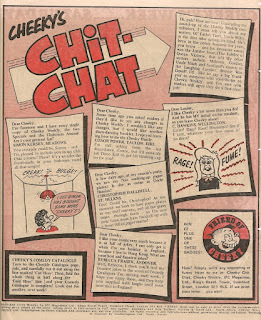 Readers had to wait seven days to learn Cheeky’s fate, which was revealed on page 2, but in that issue the back cover was host to the first instalment of yet more cut-out content, this time the Cheeky Spotter Book of Fun. The Spotter book ran on the back page for, you won’t be surprised to learn, the following three editions. A cut-out feature again occupied the page under review in the 04 February 1978 special skateboard edition. This time it was that week’s third section of the Skateboard Snap game. Contrary to my earlier assertion that these snip-and-save features ran for 4 weeks each time, all the elements of Skateboard Snap were contained within that single issue, so it troubled readers no more after this particular edition. A week later Cheeky’s slimy sidekick Snail took control of the back cover to demand of readers (rather rudely, in my opinion) ‘Oi! What’s my name?’. The inimitable invertebrate went on to explain that he was fed up with not having a proper name and senders of the best suggestions for a mollusc monicker would receive £2. A week after the second run of PUP came to an end, a new series of back cover features, which I have christened Cheeky’s Pal Puzzle, commenced. 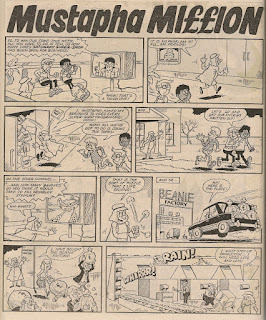 This feature occupied page 32 for 9 weeks and quite possibly generated unfavourable feedback from readers who had not succeeded in covering their bedroom walls when Pin-Up Pal ceased earlier in the year, because a new run of PUP began in the 06 January 1979 edition. This final PUP run was to last for 13 weeks, bringing the total number of times that Pin-Up Pal featured on page 32 to 35 and making it the most regular occupier of the site under review. 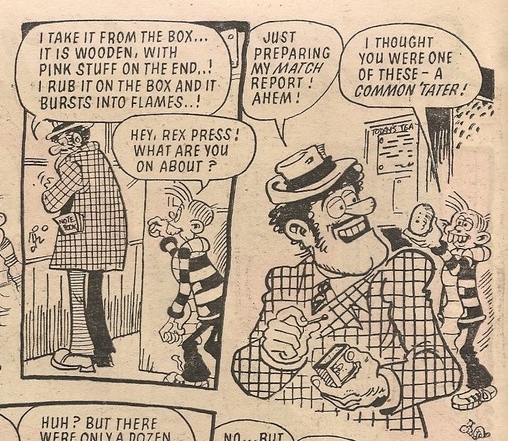 The Burpo Special was then relocated from the inside pages to the back cover, and occupied the same for 8 weeks until it was displaced by an advert for Trebor Chews featuring a colouring competition based on a Superman comic strip. 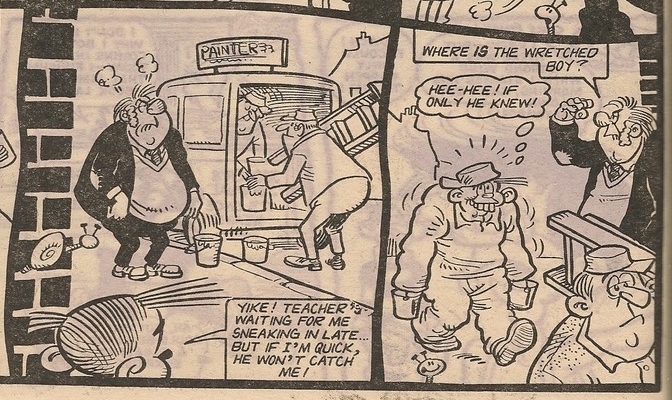 The Burpo Special then resumed its page 32 run for a further 4 weeks which brought this feature to a conclusion and made it, with 12 appearances on page 32, the third most regular visitor to the subject location. 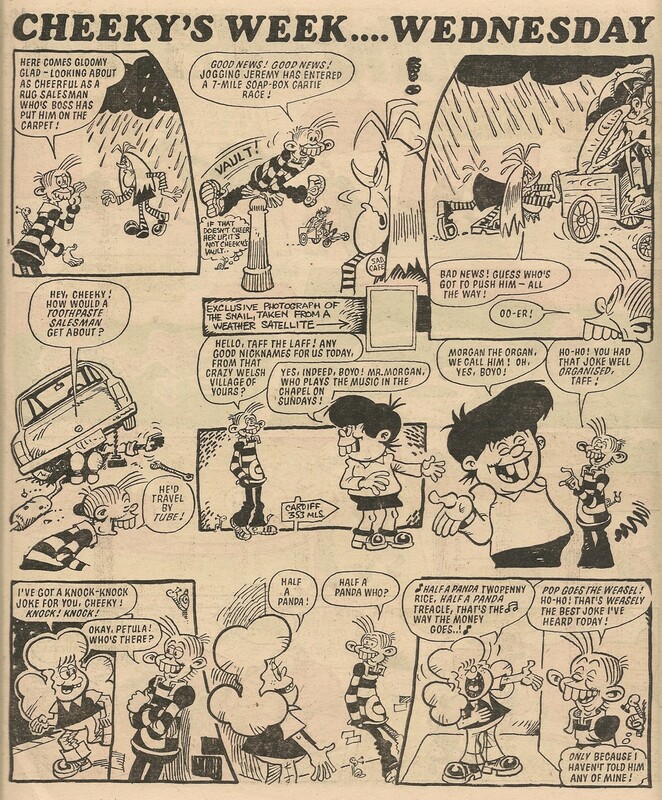 The back cover of the comic dated 07 July 1979 featured an advert for the less-than-enticing (in my view, never having been a fan of the sticky, black, tooth-discolouring and slightly bitter confectionary) liquorice novelties purveyed by Mr Bellamy. 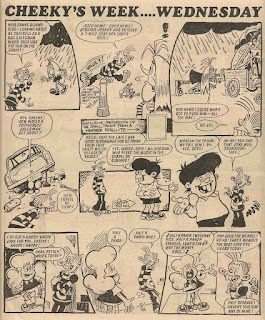 Snail of the Century, which had the distinction of being the final original strip to commence in Cheeky Weekly, then began on the back page of the issue dated 14 July 1979. This initial run was broken after 3 issues when page 32 was host to an ad placed by British Rail who wanted readers to know about their Great Rail Club, which entitled train travellers between the ages of 5 and 15 to rail discount vouchers to the value of £5. ‘You can travel with your parents, or on your own with their permission’. Snail and his back garden buddies then resumed occupation of the subject location for a further 6 issues, after which Why, Dad, Why? made a surprise bid to take control of the back cover, but was repelled just 7 days later when Snail of the Century began another 6 week residency. This time the snaily japes were interrupted by Mr Bellamy who was still trying to offload his liquorice bootlaces, pipes (yes, kids were encouraged to ape adult smokers but this was a time when the idea of kids aged 5 travelling alone on trains was apparently deemed acceptable) and sundry other unappealing ‘sweets’. 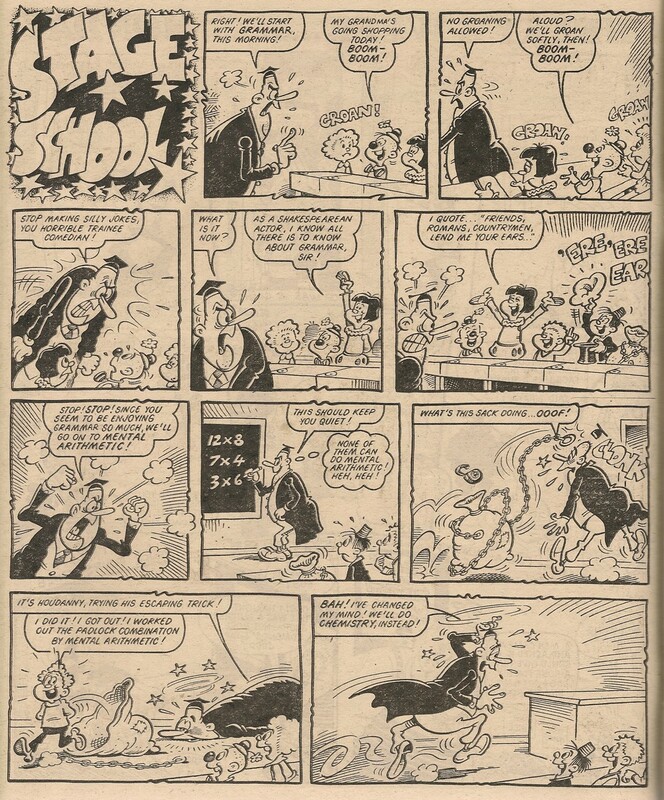 What was to be a 5 week run of SotC then commenced in the comic dated 17 November 1979, following which the hectic hilarity of Elephant on the Run made its single visit to the back page. 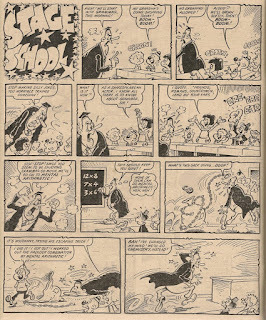 Snail-based humour then returned to the back page, and this run continued in that location until the penultimate edition of the toothy funster’s comic, dated 26 January 1980. This brought to 25 the number of times Snail of the Century had occupied page 32, making it the second most regular feature to appear there. 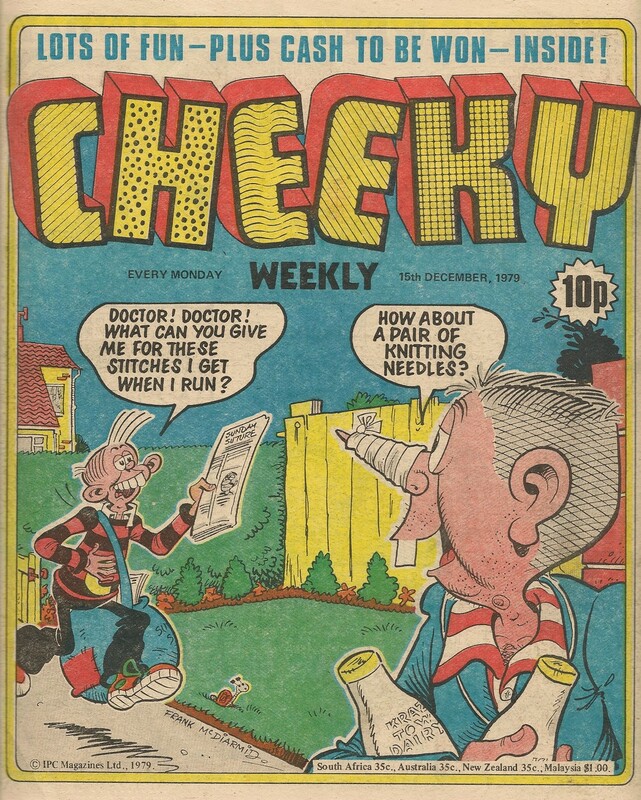 A week later the back cover of the final edition of Cheeky Weekly announced that the first combined issue of Whoopee and Cheeky would include a competition to win Corgi Friscodisco record players. 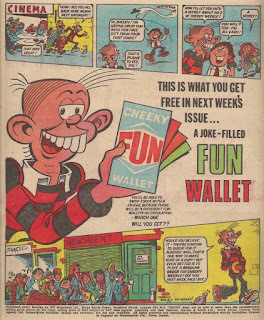 The back page ad also carried a coupon which was required in order to enter the competition together with another coupon for placing a regular order for Whoopee and Cheeky at the local newsagent. 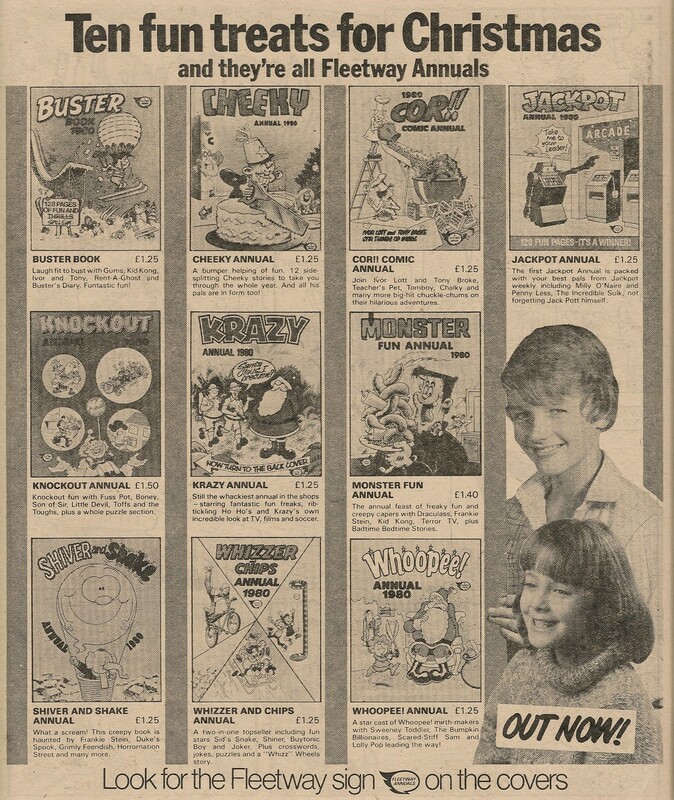 The TV ad for Friscodisco featured Tony Blackburn reading a comic, but not an IPC title - instead the disc jockey was seen with a copy of The Beano. Coming to public awareness during the satire boom of the early 1960s as one of the founders of Private Eye, cartoonist, writer and comedian Willie Rushton was later exposed to larger audiences as a contributor to TV’s That Was The Week That Was and as a panelist on BBC Radio’s anarchic comedy panel game I’m Sorry I Haven’t A Clue. Even greater media exposure ensued as Willie took his seat among the gagsters on ITV’s comedy game show, Celebrity Squares. 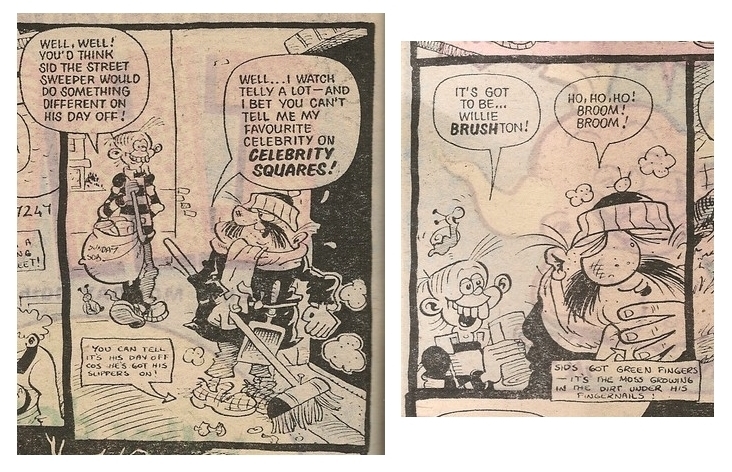 The noughts-and-crosses based quiz originally ran from 1975 to 1979, and was probably where the majority of Cheeky Weekly readers first became acquainted with the bearded funnyman, resulting in his name being adopted and adapted (twice) in relation to two of the toothy funster’s many pals. 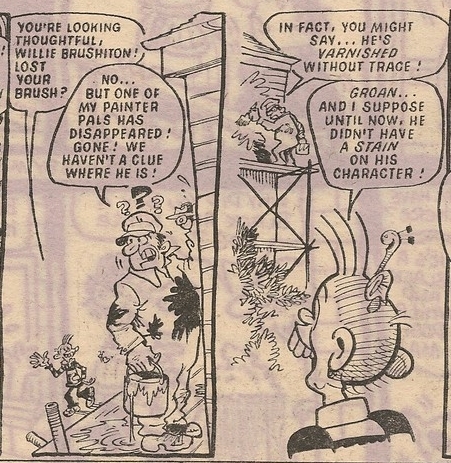 Krazy Town then appeared to be devoid of painters until the issue dated 14 October when Willie got his first name-check. 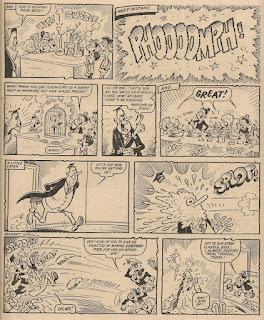 Willie was the creator of one of the seven blunders of the world, as identified by the toothy funster in Cheeky Weekly dated 11 November1978. 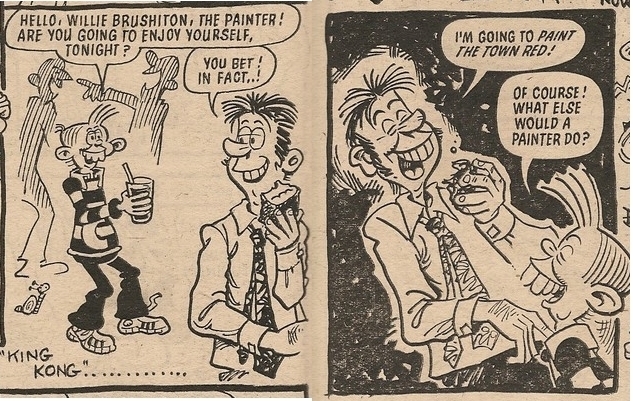 The first time we saw Willie in anything other than his paint-splattered overalls was the 23 June 1979 issue. The only edition to feature more than one appearance by the daft decorator was the comic dated 29 December 1979, wherein Willie fetched up on the Monday and Thursday pages. 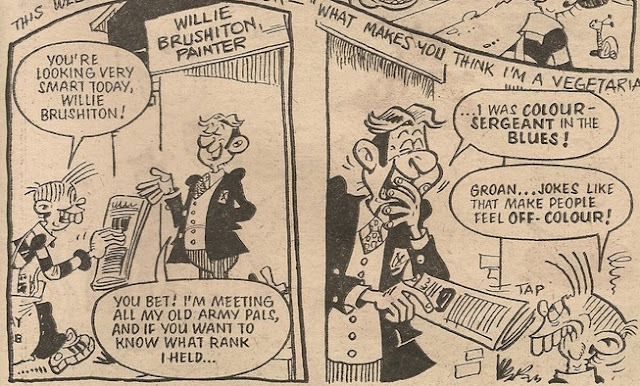 Cheeky's painter pal was never featured in Krazy, but clocked appearances in 26 editions of Cheeky Weekly (27 if we assume Willie was one of the painters in the 11 March 1978 comic). Yes, it's the Whizz-kid head honcho himself, Sid, on a solo raid without his serpentine sidekick, Slippy. Sid's smug 'I made a mug of Mustapha Million' is becoming somewhat hackneyed now, having been used by various raiders on three previous occasions that our moneyed mate has suffered raids, namely 06 December 1986, 18 October 1986 and 28 June 1986. 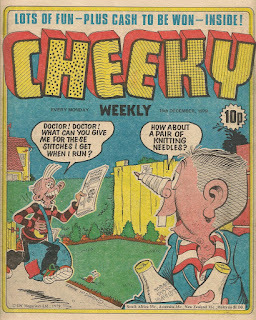 There’s a distinct air of deja vu about the cover of Cheeky Weekly issue number 110 – see the 13 October 1979 issue – as Cheeky shares an early morning gag with madcap medic Doctor Braincell. It seems the Doctor has changed his choice of Sunday paper since his last cover outing, although his order for two pints of Krazy Town Dairy’s finest gold top remains unaltered. Over the page as Cheeky’s paper round continues, our toothy pal meets the purveyor of said creamy cornflake-accompaniment, Milkie, for a gag referencing Krazy Town’s genial GP. Charlie was short of cash at the beginning of last week’s Calculator Kid, and this week despite hankering for fish and chips, our impecunious pal finds he’s only got enough funds for a portion of chips. To make things worse, Calc advises his young owner to hold off consuming his 'chippy aroma'-generating fried spuds while wandering around Krazy Town. Eventually the newspaper-wrapped snack goes cold and has to be disposed of but Calc's microchip machinations bring the tale to a happy, slap-up feed conclusion. 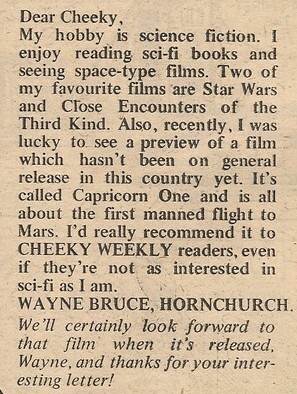 Friend of Cheeky and sci-fi fan Wayne Bruce, who had a letter published on the Chit-Chat page in the 13 January 1979 issue (and I'll repeat my joke that he’s probably a friend of Kent Clark) is among the lucky gag-writers for this week’s Paddywack page. 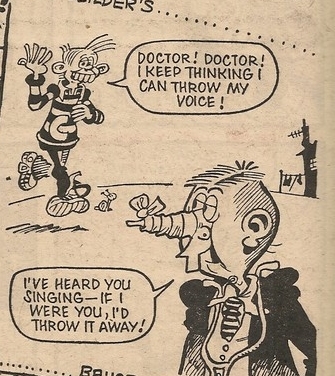 On Monday Cheeky has another encounter with the silly stethoscope-wrangler. A nice Stage School set this week, with the added bonus of the rare sight of junior escapologist Houdanny liberating himself from his sack. 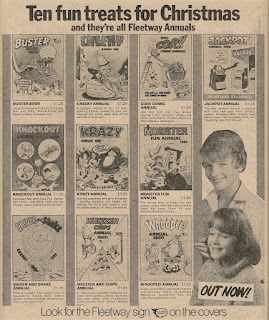 With Christmas fast approaching, page 8 hosts an in-house ad for Fleetway annuals, including this year's Cheeky offering. Pages 13 and 14 are the location of filler feature Cheeky’s Cut-Out Comedy Catalogue, this week consisting of Mechanic jokes, and the toothy funster shares a gag (not among those featured in the catalogue) with the comedic car-repairer on Wednesday. 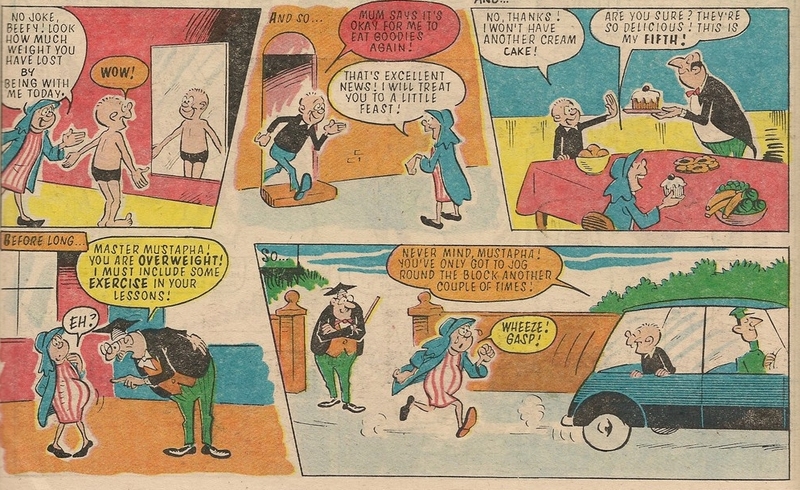 I can’t help feeling that our middle-eastern mate should have directed his exercise regime at the considerably heavier Tub, Mustapha’s erstwhile Mystery Comic colleague, who appeared a few pages earlier. 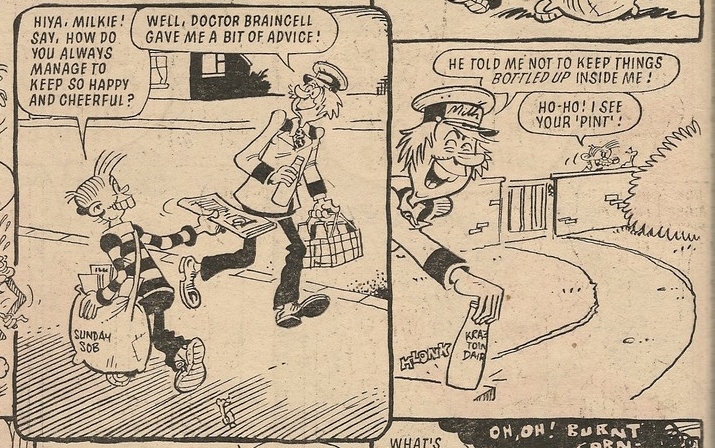 The normally vigilant Speed Squad fail to recognise Rex Press in this week’s story which can be seen here. 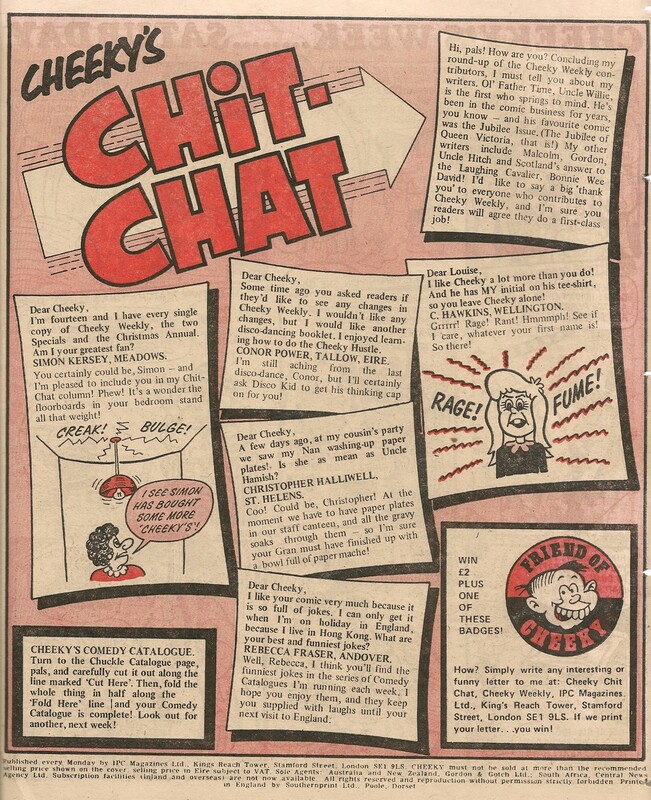 On the Chit-Chat page Cheeky concludes his series of articles about the creators of our favourite comic with a brief run down of the writers. Willie is presumably Willie Cook (whose real name is, according to Frank McDiarmid’s interview in Crikey! 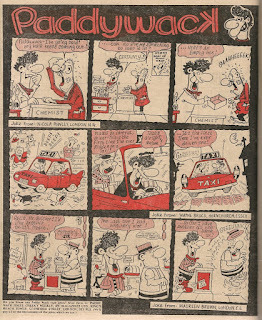 issue 12, Gordon Cook). I can’t put surnames to any of the others mentioned. Cheeky’s Saturday afternoon is spent at the Krazy Town FC football match, where he meets the jolly journalist whom Speed Squad failed to recognise. 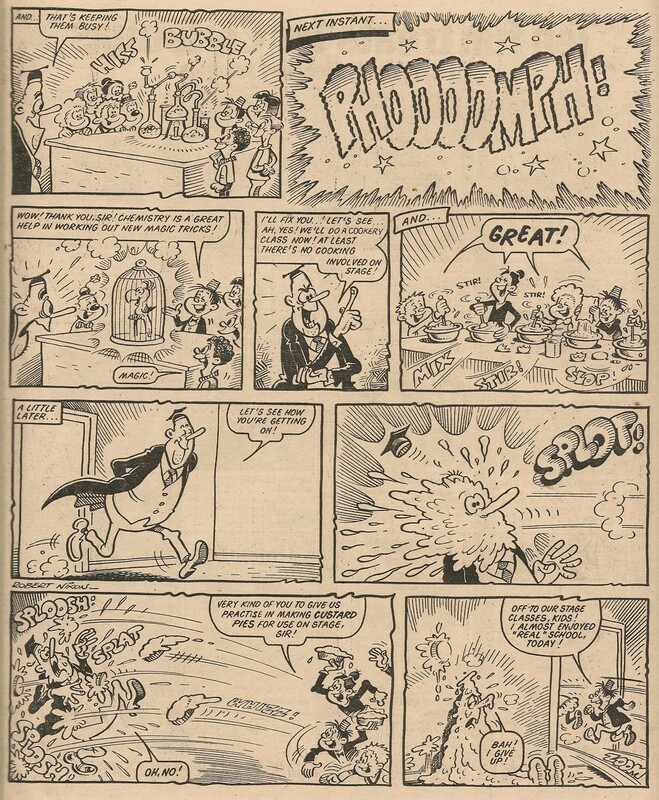 Once again Snail of the Century rounds off the comic, which for the second consecutive week has included an all-Frank McDiarmid Cheeky’s Week (the first time we've enjoyed 2 consecutive all-Frank issues since 04 and 11 August 1979).